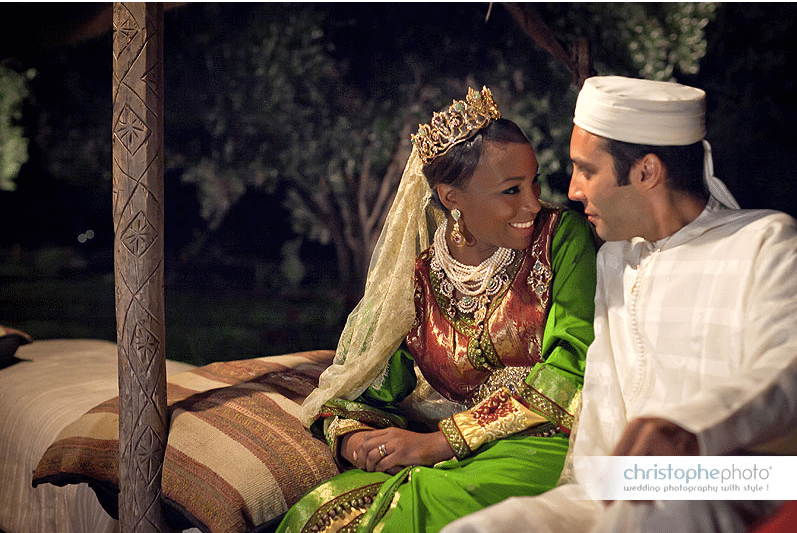 You have to see this spectacular multicultural wedding video of Cynthia and Hatim. They live in Paris and married in Hatim’s native Morocco. You see some elements from Martinique from where the bride hails, but by far we can’t help but notice marvelous Moroccan customs such as the professionals dressing the bride for a 5 time change of clothes. (Moroccan customs can have up to 8 clothing changes). Seems that no expense was spared as this is a real celebration. Obliviously Hatim loves this beautiful woman named Cynthia and she looks at him like he is a prince! Cérémonies à Marrakech from Mariage de Cynthia et Hatim on Vimeo. Beautiful pics are found on Munaluchi Brides by Christophe Photo. Gorgeous!